We all have reasons to run. Many of us may run a marathon or a run in memory of someone or for our own personal reason. One Canadian has decided to cross Canada for his cause. Twice. A runner who calls himself Fast Eddy has begun his planned 21,585K ultra-ultra marathon across Canada, raising money for Alzheimer’s and breast cancer charities in each province. He’s also running solo and unsupported with a running stroller. As ff that weren’t challenging enough, Eddy will also be running a 24-hour endurance event in each province, hoping supporters will come out to watch. Fast Eddy’s real name is Edward Dostaler. The 26-year-old gave up his job to run across Canada, turn around, and run back, alone. Eddy used to be a sprinter. It took him 16 months to transition to become a long-distance runner. Eddy is running for his grandmother, who has Alzheimer’s. He first got the idea to run across Canada when he was just 15, after finishing a school paper on Terry Fox and Rick Hansen. But it wasn’t until his grandmother’s diagnosis that he started to actually plan anything. It was a long journey from running 200 metres to being able to run 65 kilometres a day. I asked Eddy a few questions about the journey. 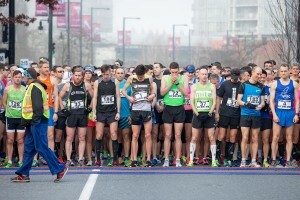 How did you prepare for your run across Canada? Physically, I tried to increase my endurance as much as possible without injury and going too far. I swam, rowed, biked and, of course, ran. I ran a lot of longer days and determined that 60 kilometres was a nice number to stay at. What is the hardest part about running day after day? How do you do it mentally and physically? Physically, my body takes a pounding, however, I run slower and longer so I burn fewer calories. I try to keep myself motivated by being quite active with social media and keeping up to date with interviews as well as common questions. This is going to be a big mental challenge. I will have huge ups and even bigger downs. It’s not just a run there and back, but there are ten 24-hour runs as well. The last one in Calgary had fewer than 10 people show up. You need to remember those who do support you and try and work even harder to ignore those who might not care about what you are trying to do. Keep the random acts of kindness close: a random act of kindness can create an endless ripple. I also listen to music to stay focused. What has been the most memorable thing on your run to date? The support from people from far and wide. I ask a lot of people to run 5Kor less and post a sign saying what they did and go “Fast Eddy Go” to try and get some motivation. When those around you do it and you see people going after their dreams of all kinds it becomes something magical. You really can make a difference if you are willing to work hard and take that first step. To follow Eddy’s run or find out more about him – check out his website or follow him on Twitter @FastEddyCanada. You can also catch me on Twitter @NoelPaine or on my personal blog. I went to High School with Eddy in Clearwater BC. I remember how determined and focused Eddy was then, and compare it to now and trust me when I say that nothing is going to stop Eddy in completing this run across Canada and back. He is very strong, very determined and an extremely emotionally connected person. I really look forward to watching and hearing about his progress. He is truly Amazing and even though it seems not many people are paying attention, they are Eddy and it’s only going to grow more and more the further along that you get. Keep Going Bud. You can do this. I also was a fellow classmate of Eddy’s. I couldn’t agree with Heather any more. Determined. Definition of him in one word. Endured a fair amount of trials in his life, he is a strong person and once sets his mind to something. He will succeed. I admire your determination Eddy and wish only the very best for you and both of the causes you’re raising awareness for.